Super Vijay rugs - Handmade to a high standard in India, the pile is woven from pure New Zealand wool. 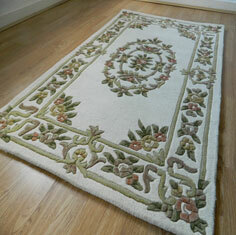 Each rug is hand-finished and carved to give a thick embossed look, feel and texture. Super Vijay rugs draw the inspiration from the French Aubusson pattern, there are four colours in this design, green, cream, red and blue. Recently a cream panel design has been added to the range. Super Vijay rugs are available in large sizes, a circle and a half moon. Bespoke sizes are available to order, please contact us for details.